Plaxico Antonio Burress (born August 12, 1977) is a former American football wide receiver. He was drafted by the Pittsburgh Steelers eighth overall in the 2000 NFL Draft and also played for the New York Giants and the New York Jets. He caught the game-winning catch of Super Bowl XLII as the Giants beat the New England Patriots. He played college football at Michigan State. After being drafted eighth overall in the 2000 NFL Draft, Burress went on to play five years with the Pittsburgh Steelers, amassing 261 receptions for 4,164 yards, 22 touchdowns, and six fumbles over the span of 71 games. Burress was featured on the MTV show True Life, documenting his rookie season. He first broke the 1,000-yard mark in his second season, gaining 1,008 yards on 66 receptions. Burress's best season with the Steelers came in 2002, when he set his career highs for receptions (78) and yards (1,325), to go along with seven touchdowns. Also in 2002, Burress played in his first career playoff game, accumulating six receptions for 100 yards and a touchdown. In three subsequent playoff games with the Steelers, Burress totaled only seven receptions, 123 yards, and one touchdown. Burress's 1,008-yard season in 2001, combined with Hines Ward's 1,003 receiving yards, gave the Steelers their first pair of 1,000-yard receivers. The two would combine to accomplish the same feat in 2002. On November 10, 2002, Burress took advantage of an extra 15 minutes of play to set a Steelers franchise record with 253 receiving yards in a 34–34 tie against the Atlanta Falcons. He caught nine passes and scored two touchdowns in the game, and nearly won it but was stopped at the 1-yard line as time expired. Burress at the Giants Super Bowl champions parade in NYC. In the 2006 season, Burress managed a career high ten touchdowns but fell short of the 1,000-yard mark, appearing in only 15 games and struggling with a groin injury for much of the year. The Giants lost six of their last eight games and fell in the NFC Wild Card playoffs to the NFC East champion Philadelphia Eagles 23–20. Burress had a touchdown catch on the opening drive and finished the game with five receptions for 89 yards and two touchdowns. In Super Bowl XLII, Burress caught the game-winning touchdown pass that made the score 17–14 in the Giants' favor. He gained a measure of "Super Bowl legend" by predicting the Patriots lose by the score 23–17. Before their May mini-camp, Burress and his teammates were invited by former President George W. Bush to the White House on April 30, 2008 to honor their victory in Super Bowl XLII. Just before the start of the Giants mandatory May mini-camp, Burress had said that he would not participate in the camp because he was upset with his contract. He attended the camp to avoid paying a fine but refused to practice with the team. Although he was slated to receive $3.25 million for 2008, Burress felt underpaid compared to other star receivers. After indicating that he might hold out training camp as well, he joined, but practiced very little, claiming his ankle was injured. Burress with the Giants in 2008. On December 23, 2008, a search of Burress' New Jersey home by the Totowa, New Jersey police, the New York Police Department, and investigators from the Manhattan District Attorney turned up a 9 mm handgun, a rifle, ammunition and the clothing believed to have been worn by Burress on the night of his accidental shooting. On June 12, 2009 Burress's attorney Benjamin Brafman announced that he had been unable to reach a sentencing agreement. Burress asked a Manhattan grand jury for sympathy during two hours of testimony on July 29, 2009. On Monday, August 3, 2009, prosecutors announced that Burress had been indicted by the grand jury on two counts of criminal possession of a weapon in the second degree, and a single count of reckless endangerment in the second degree, all felonies. Burress had a civil lawsuit, filed on December 8, 2008, in Broward County, Florida, in which Alise Smith claimed that Burress's $140,000 Mercedes-Benz collided with the back of her car. The suit claimed that Burress was liable for causing permanent injuries to the woman. Burress's car insurance policy had been cancelled three days before the accident due to nonpayment of the premium. In 2012, he was ordered to pay Smith $159,000, but as late as May 2013, had not made any payments. On April 30, 2015, Burress was indicted by the State of New Jersey on charges that he failed to pay nearly $48,000 in income taxes. Burress filed his 2013 State income tax return on Oct. 20, 2014, for which he submitted an electronic transfer. According to the State Division of Taxation, the transfer failed to go through. Burress was notified multiple times in an attempt to collect the tax debt, including via certified mail, but never responded. The indictment made him the first person in New Jersey to be charged under a new state law which treats bad electronic money transfers as a criminal offense, equivalent to writing bad checks. On December 7, 2015, Burress entered into a plea agreement in a hearing at Mercer County Superior Court, admitting guilt in failure to pay $46,000 in taxes on his 2013 tax return (a year in which he earned $1,000,000 in income.) Burress faces up to 5 years probation at his February 5, 2016 sentencing hearing. He will have to pay $56,000 in penalties and restitution. Though he avoided prison time by pleading guilty, failure to pay the amount in full by the conclusion of his probation could result Burress being incarcerated. Plaxico Burress, named after his uncle, was born to Vicki Burress (now deceased) in Norfolk, Virginia, United States. He has two brothers, Ricardo and Carlos. Burress has been married to Tiffany Glenn since July 2005  and they have one son, Elijah and a daughter, Giovanna, born November 2009. Burress graduated from Green Run High School in Virginia Beach, Virginia in 1996 and spent a post-graduate year at Fork Union Military Academy in Fork Union, Virginia. He lives in Totowa, New Jersey. He co-wrote the book Giant: The Road to the Super Bowl (ISBN 978-0-06-169574-2), published July 1, 2008 by It Books, about his Super Bowl experience. ↑ Branch, John (November 30, 2008). "Plaxico Burress Shoots Himself Accidentally". The New York Times. ↑ "True Life Episode Guide 2001 - I'm an NFL Rookie". TVGuide.com. Retrieved 2012-10-30. ↑ Pedulla, Tom (2002-11-12). "Burress reaches for potential". USA Today. Retrieved 2008-09-24. ↑ "Hines Ward: Career Stats". NFL.com. Retrieved 2008-09-24. ↑ Eisen, Michael (2005-03-18). "Giants Sign WR Plaxico Burress". Giants.com. Retrieved 2008-11-30. ↑ Ashdown, John (2008-02-04). "New England Patriots 14–17 New York Giants". The Guardian. London. Retrieved 2008-02-27. 1 2 Garafolo, Mike (2008-06-11). "Burress sitting out in contract dispute". The Star-Ledger. Retrieved 2008-11-30. 1 2 Schwartz, Paul (2008-06-11). "Plaxico says he Won't Practice; Upset Over Contract, Giants Receiver Claims it's a 'Business Decision'". New York Post. Retrieved 2008-11-30. ↑ "Burress says ankle injury, not contract, keeping him from practice". ESPN.com. Associated Press. 2008-07-29. Retrieved 2008-11-30. ↑ Schwartz, Paul. (December 2, 2008).BURRESS DEAL HAS LOOPHOLES New York Post. Retrieved May 15, 2009. ↑ "Giants cut WR Plaxico Burress". Daily News. New York. Archived from the original on April 4, 2009. Retrieved 2009-04-03. ↑ Cimini, Rich (July 31, 2011). "Sources: Plaxico Burress, Jets agree". ESPN New York. Archived from the original on July 31, 2011. Retrieved July 31, 2011. ↑ Hanzus, Dan (November 20, 2012). "Plaxico Burress signs contract with Pittsburgh Steelers". NFL.com. Retrieved 2012-11-20. ↑ "Plax extends stay with Steelers". Daily News. New York. ↑ "Steelers Place Burress on Reserve/Injured List". Steelers.com. August 13, 2013. Retrieved August 14, 2013. ↑ "Plaxico Burress Stats". ESPN Internet Ventures. Retrieved 8 May 2014. ↑ "Exclusive: Burress involved in domestic disputes". The Record (Bergen County),. 2008-09-24. Archived from the original on September 28, 2008. Retrieved 2008-11-16. ↑ Kopel, David (2008-12-04). "Free Plaxico Burress". Wall Street Journal. Retrieved 2009-02-15. ↑ "Press Releases | The New York County District Attorney's Office". Manhattanda.org. Retrieved 2012-10-30. ↑ Maske, Mark (November 30, 2008). "Burress Accidentally Shoots Himself in Leg". Washington Post. Retrieved 2008-11-30. ↑ Macur, Juliet (November 30, 2008). "Burress Will Surrender to Authorities on Monday". The New York Times. Retrieved 2008-11-30. ↑ Italiano, Laura (2008-12-01). "Bloomberg slams Burress for shooting cover-up". The New York Post. Archived from the original on 2008-12-03. Retrieved 2008-12-02. ↑ Macur, Juliet (December 1, 2008). "Plaxico Burress Surrenders to Police". The New York Times. Retrieved 2008-12-01. ↑ "Plaxico Burress posts bail as New York Giants weigh options". Los Angeles Times. 2008-12-02. Retrieved 2008-12-04. ↑ LaPointe, Joe. 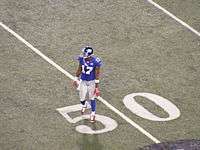 "Giants Say Burress’s Season Is Over", The New York Times, 2 December 2008. ↑ Associated Press. Giants suspend Burress four games in wake of weapons charges. ESPN, 2 December 2008. ↑ "Non-football injury list protects Giants". New York Newsday, 3 December 2008. ↑ "NFLPA files grievance challenging Burress' suspension, fine." ESPN. 10 December 2008. ↑ Vacchiano, Ralph; Myers, Gary (2009-04-06). "Plaxico Burress beats Giants in court, wide receiver grabs million bonus". Daily News. New York. ↑ Gun Seized in Search of NFL Player's Home, CNN.com, 24 December 2008. ↑ Grace, Melissa (12 June 2009). "Plaxico Burress case goes long: Failure to reach plea deal delays ex-Giant receiver's trial". Daily News. New York. ↑ "Former Giants Star Defends Himself to Grand Jury in Weapons Case", The New York Times, 29 July 2009. 1 2 Zand, Joel (20 August 2009). "Ex-Giant Plaxico Burress Pleads Guilty in N.Y.C. Gun Case". FindLaw. Retrieved 2009-09-22. ↑ Eligon, John; Berger, Joseph (3 August 2009). "Burress Is Indicted on Weapons Charges". City Room. The New York Times. Retrieved 2010-05-22. ↑ Honan, Edith; Trotta, Daniel (3 August 2009). "Plaxico Burress indicted on weapons charges". Reuters. ↑ Italiano, Laura; Mangan, Dan (2009-08-22). "Plaxico's Jailhouse 'Trainer' - Hires expert to prep". New York Post. Retrieved 2009-08-23. ↑ Grace, Melissa; Schapiro, Rich (2010-01-07). "No early jail release for ex-Giants star Plaxico Burress; work release request denied". Daily News. New York. Retrieved 2010-02-05. ↑ Cruz, Alicia (17 May 2011). "What teams are interested in signing Plaxico Burress?". New Jersey Newsroom. Archived from the original on 2011-05-21. ↑ "Former Giants Receiver Plaxico Burress Released From Prison". NY1.com. 6 June 2011. Archived from the original on 2012-10-04. ↑ "Burress has string of debtor lawsuits". Sports.espn.go.com. 2009-02-09. Retrieved 2012-10-30. ↑ "Plaxico Burress Indicted in New Jersey on Tax Charges". www.newyorktimes.com. Retrieved 10 December 2015. ↑ "Plaxico Burress pleads guilty to tax evasion". espn.com. Retrieved 10 December 2015. ↑ "Former Giant, Jet Plaxico Burress pleads guilty to tax evasion and now waits on sentencing". nydailynews.com. ↑ "Plaxico Buress' Wife Tiffany Glenn". Ballers Wives. ↑ "Plaxico Burress". New York Giants. Archived from the original on 2008-12-21. ↑ Hollander, Dave (October 25, 2007). "Burress Ready to Discover Old World". Sports.aol.com. Retrieved 2008-12-05. ↑ "Plaxico Burress SNY's Newest NFL Analyst". 247sports.com.